We picked Two Rivers Campground based on reviews. They are located just two miles north of Opryland and shopping area, Opry Mills off of I-65. We arrived about 3 pm to check-in experiencing typical process. The sites are very tight even though they told us on the phone that we would have no problem parking a big rig. Lots of trees and oftentimes, vehicles parked that may hinder maneuverability. The campground had a ‘campy’ damp feel with all of the trees, packed mud, etc. The sites were packed dirt/mud with a small concrete pad with a picnic table. The sites backed up to each other; therefore, not good for toyhaulers that need to unload their toys from the rear of their coaches. The bath houses were not great; poor lighting and dirty, even throughout all hours of the day/night. They have a camp store on location. Camping World is located right down the road within walking distance. While it is located near Nashville tourist areas, next time, we will camp/park elsewhere. We will not be returning to Two Rivers Campground . We were pleasanty surprised when we arrived at Red Stone Arsenal Campground. This RV Park is located ‘on post’ therefore we had to go through post security gates. Easy to get to. Once on post, signs direct you to RV park area. Fairly new concrete pads 25 x 65. Clean sites! Fire pit and picnic table at each site. Please know there aren’t trees except for occasional sapplings in RV Park area; we stayed in the winter therefore wasn’t an issue but can imagine summer months to be considered. Stay limit is 60 days during peak season and 90 days during non-peak season per SOP and AR-215 regulations. Sites 2 and 3 are designated for overnight campers only and may use the self-check box. Stays for longer than 1 night should make reservations via telephone or check in at the Outdoor Rec office to insure availability (sites may already be reserved). Free limited WiFi at the RV Park. We had to use our own AT&T Hot Spot. Limited cable TV, RV Storage lot, Dog Run. Other MWR facilities on post such as Outdoor Recreation (equipment rental), bowling, bingo, golf, Officer’s Club, and more. Laundry room was clean; had three working washers/dryers with fold tables and chairs to sit. Bath houses had single shower and single stall toilet, so you had to wait your turn to shower but that didn’t affect us as we were self contained. Playground for children in back of pavilion. Great safe place for kids to ride their bikes. Diesel not available on post; had to go off post to fill up truck before hooking up. This IS a military arsenal so be aware that you will hear the sounds of freedom with big booms and bangs from their training area but none to deter us from leaving. Close to post/base ammenities and services (golf, library, gas station, commissary, PX, fitness center, shopette, swimming, snack bar, Class VI, movie theater, museum, hospital, post office and car wash.
We enjoyed our stay here and would return again. 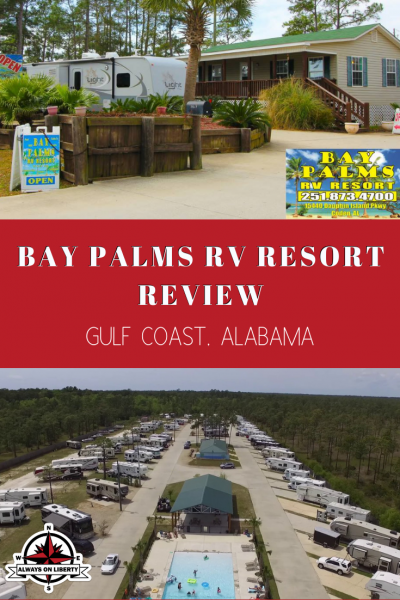 We found Bay Palms RV Resort via RV Park Reviews. We called to make a reservation about two months prior to arriving. The office staff was friendly and our reservation process went smoothly. She let us know that the day we would arrive, there was a holiday pot luck party. So, I RSVP’d immediately. Bay Palms RV Resort is located on Rt 193. Its about 7 miles to Dauphin Island, 30 minutes to Mobile and roughly 15 miles to I-10 (Dauphin Island Exit). Their rates were comparable and competitive to those in the area and conducive to the type of location. Check-in was quick and efficient. We were handed a copy of their policy and rules. Navigating the resort was easy. Most sites are paved concrete pads with exception of the center big rig (where we were) which are hard-packed, crushed shell. Our pull-through site was located in the back middle of the resort. It was easy to pull in despite our toy hauler fifth wheel length. 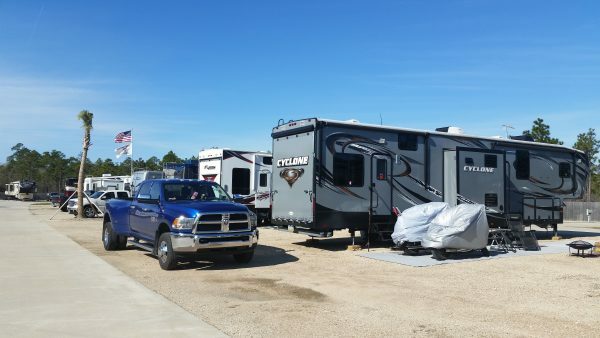 There was plenty of room to park our RV, truck and two motorcycles. Be aware that Bay Palms RV Resort does not provide picnic tables or fire pits at each site. 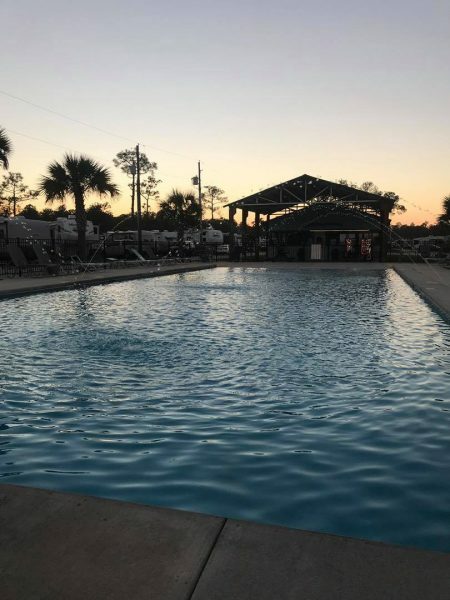 I can’t say enough about Bay Palms RV Resort amenities! Let me say this. There is ALWAYS something fun being planned or happening. They leave no stone unturned when it comes to entertaining their guests. Lots of potluck meals, pool parties, games, fishing outings, etc. They even had a big Mardi Gras party during our stay. Bath houses, though dated, are clean and sufficient. There are two laundry rooms with two washers, two driers each and folding table. The laundry facility is clean and in same building as bath house and restrooms. Propane is available for sale and delivered to your site from the staff (small portable tanks only). The recently remodeled pool and playground is in operation during Spring, Summer and Fall seasons. They also built an oversized pavilion to shelter from the hot sun or allow parties to continue during tropical rains. While we were there, they had huge fire pits and grills all for the using. There is a small camp store in the office. I also wanted to add that because of it’s locale and proximity to great Gulf fishing, they also have a fish cleaning station. Don’t forget to pin this to your Pinterest board! 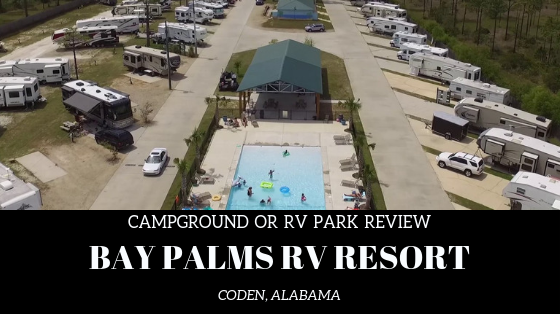 Located south of Mobile, Alabama, this RV resort is a friendly, code-gated place to enjoy the Gulf Coast! It’s also perfectly located for day trips to Mobile and Dauphin Island. While some may question the validity of this facility being labeled ‘resort’, there are several factors that place this one in a resort category. First, it’s located right across the Gulf of Mexico with easy access to the beaches of Dauphin Island. It has a beautiful pool. It has propane delivered to your site. So, while ‘small’ and not impeccably manicured (because of it’s coastal theme), it resembles many that are ‘resorts’. 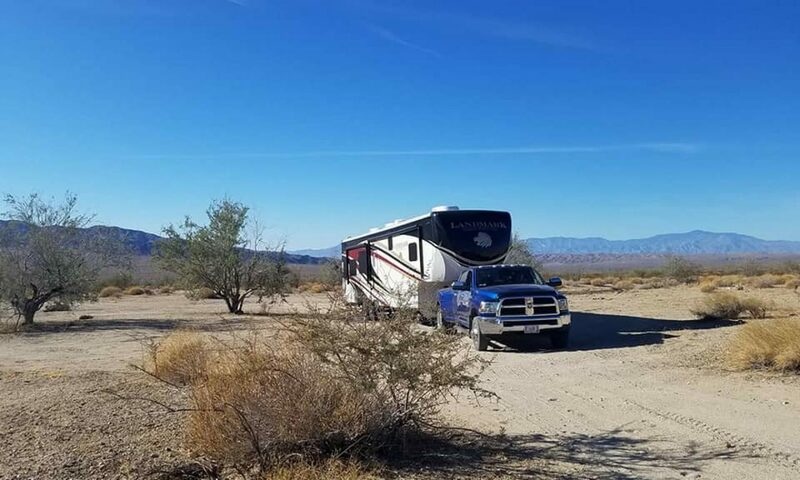 We did want to be transparent in saying that there are quite a number of permanent residents and they do allow some RV and vehicle maintenance at their sites. Even so, we made life-long friends here with the full-time residents. They made us feel welcome! 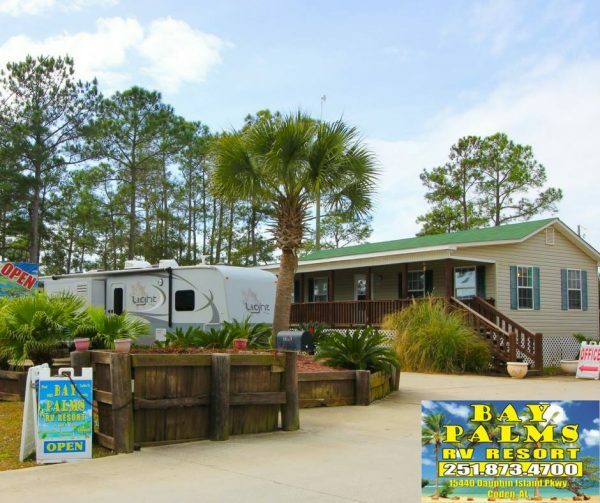 Bay Palms RV Resort is a family friendly FUN RV Resort that we will definitely stay at again!! We’ve stayed at Taylorsville Lake State Park several times throughout the spring, summer and fall of 2014. 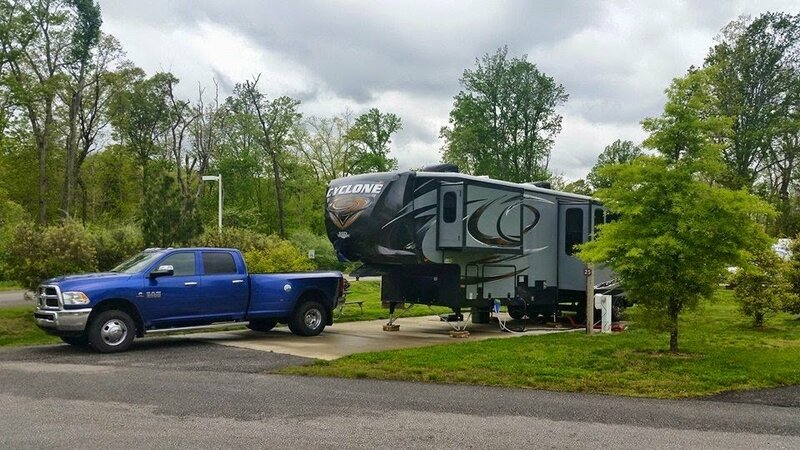 The campground is located approximately 20 miles from the Blue Grass Parkway, 15 miles from I-64 (Shelbyville Exit – Follow signs to Taylorsville Lake State Park) and 5 miles to the small town of Taylorsville. You can either reserve your campsites via Reserve America or call their office during normal business hours. Campsites are spacious and clean with a picnic table and fire ring. There are three camping areas; primitive (tents only), Equestrian (horse trailers only) and the RV section. Big Rig friendly!! Very few 50 amp sites; a few pull throughs and a couple Handicap sites available. Bath houses are clean and roomy. The primitive/equestrian area bath house may show a little dirty as where the sites are located. Sometimes they have a Camp Host, sometimes not. Staff tries to accommodate. Ice and Firewood are located for sale at the entrance station during daytime hours. Playgrounds and horse shoe pits located in each area. Family and Dog friendly. You’re on your own for WiFi. Recommend having a hotspot or jetpack if you plan on staying longer term. Lots of cool hilly trails for hiking. Lake is about 2 miles down the road for fishing and ramp for boating. Close to the Bourbon Trail and about 40 minutes to Louisville. We gave this campground a 4 out of 5 because there is no sewer and lack of regularly scheduled Camp Host. We will camp here again!